Walking Football (WF) has become a phenomenon nationally and, beyond enjoyment and exercise, provides subtantial health and social benefits for both Ladies and Gentlemen primarily aged 50 years old+ . Not least in Buckinghamshire, where South Bucks & Chiltern WFC have taken the lead and now deliver 8 WF sessions every week, stage 3 WF Festival events every year and we also run 3 teams who play in leagues and tournaments. Most people who take up our slowed down version of the 'Beautiful Game' haven't played for very many years (if ever) and a significant number of people return to meaningful regular activity via WF and these include people recovering from serious illnesses and cancers, mental health issues and, also, sufferers helping manage their diabetes by playing regularly. To expand our programme and provide these key health and social benefits for more and more people 50+, we need to invest in obtaining more kit & equipment, subsidise facility fees and fund additional marketing. It is well established that regular activity, both in terms of exercise and social interaction, is the key to a healthy life in people's later years. Indeed with the NHS spending somewhere close to 65% of it's budget on this age group, healthy 'seniors' are an absolute plus for society as a whole. Football being the national sport and with so many people having played in their respective youths (not that anyone needs to have played previously to take part), the ability now to again play in a slowed down version of the game once much loved is very attractive. And that's certainly the case once people are introduced to the game and experience a Walking Football session close to where they live. Undisputedly the case that once people come along for the first time and take part, we very rarely lose them. This project is enabled for overfunding. If the project hits its funding goal before the end of the campaign period, any extra funds raised will be spent (in order of priority) on: Marketing development to further raise the profile of walking football, the benefits and to further promote our sessions - and the welcome that awaits. South Bucks & Chiltern Walking Football Club is a community based organisation focused on proving inclusive, safe and healthy Walking Football sessions across Buckinghamshire. Having evolved successfully since the club's inception 4 years ago now, we facilite 8 Walking Football sessions every week at various locations across the area. 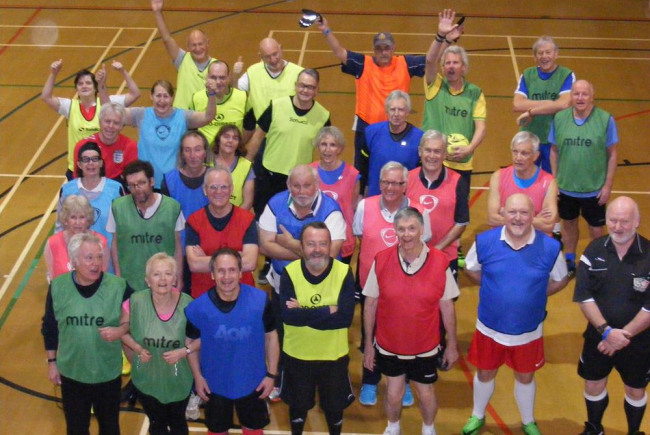 Our sessions accommodate players - both Ladies and Gentlemen aged 50 and over - of all abilities ( and in some cases disabilities) and ensure that all players enjoy and benefit from Walking Football sessions that are focused on fun, empathy and safety. WALKING FOOTBALL IN SOUTH BUCKS & CHILTERN – sessions to suit all every week and so “come and have a go if you think you’re slow enough”??? Project Delivery Manager: South Bucks & Chiltern Walking Football Club The Project Delivery Manager takes legal responsibility for receiving and spending the funds raised and ensuring the project is delivered.